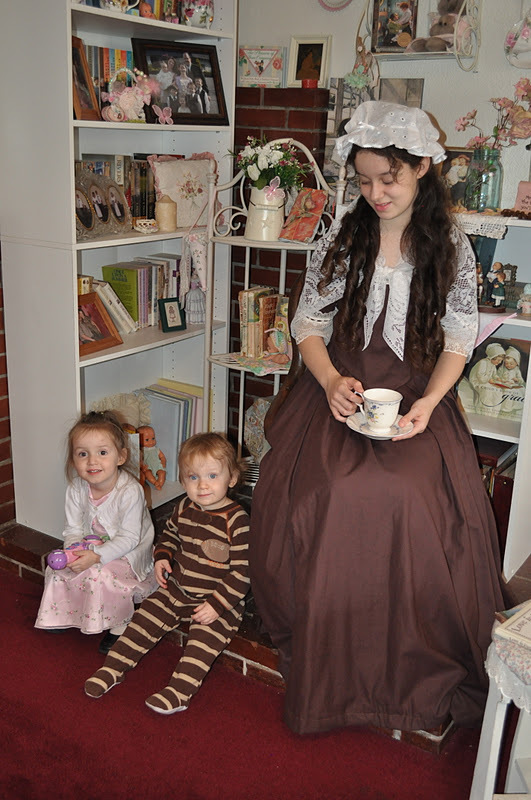 Classical Homemaking: Lynzie's Colonial Dress and Homemaking Link-Up Weekend! Lynzie's Colonial Dress and Homemaking Link-Up Weekend! Hello everyone, it's the weekend! Woot! Woot! Welcome to the Homemaking Link-Up Weekend here at Hope In Every Season. I'm so excited to report that last week, my very first week hosting the party, was a total success! As promised, I've chosen a couple of participants to feature who especially blessed me with their posts. I'll introduce you to Lydia and Mary Joy in just a moment! Today, I'm sharing the sweet Colonial-style dress that I made for my daughter, Lynzie, a couple months ago. 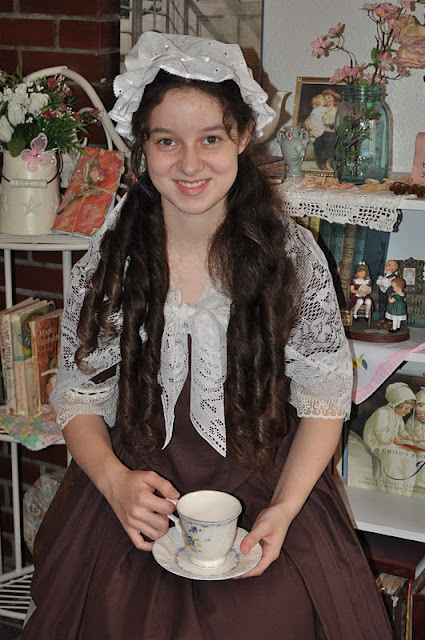 I love this pattern and have made several dresses for her with it over the last few years. 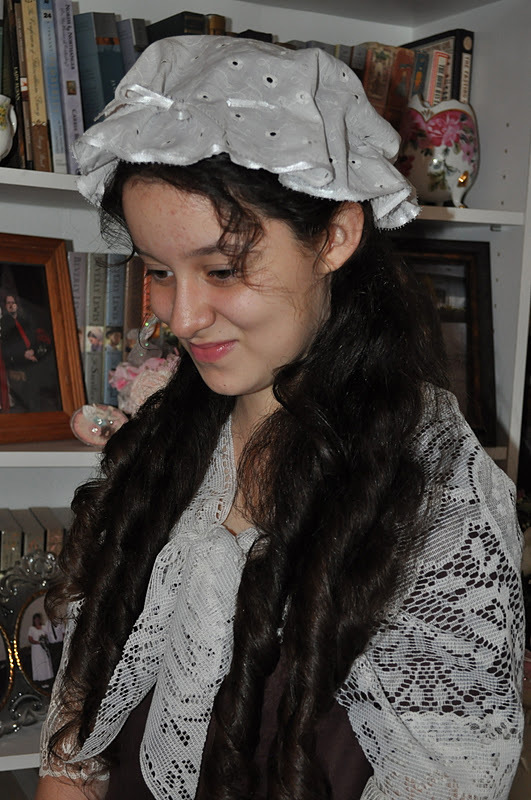 She wanted an outfit to look just like the American Girl doll, Felicity Merriman, from 1776. We made her a mob cap from a simple pattern I found online. 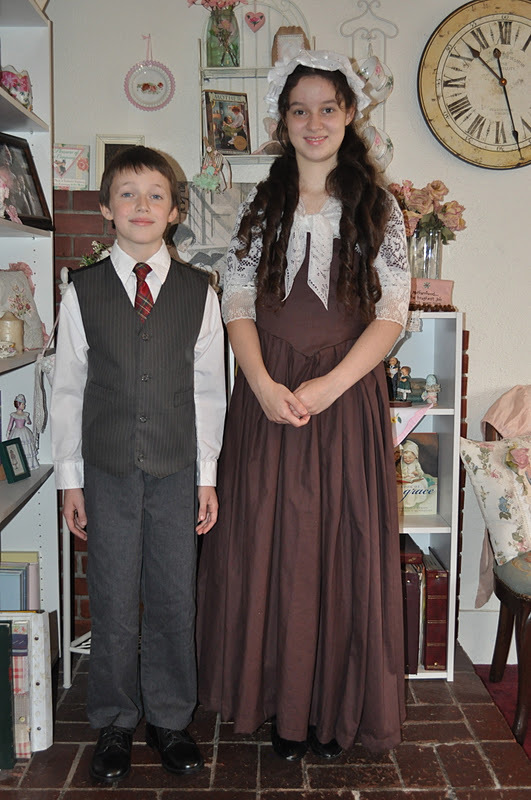 Lynzie, 11, and Michael, 9, are headed to the Oregon state piano recital this Saturday in Albany and they're very excited! Here they are on the day of the local recital in which they placed as alternates to State. Since one winning team was not able to go, our kids get to go in their place! We are so proud of our sweet kids, but not so much because they're excellent piano players. Each one of our children is kind, compassionate, creative, honest, and striving to live a life that is pleasing to God in the state of maturity that they're in. What a blessing our eight children are to us! First, I'd like to introduce you to Lydia of The Vintage Mama. Lydia linked up to my Homemaking Link-Up Weekend last weekend and shared with us her great ideas for cooking with Pumpkin Puree. Some of my favorites included great recipes for Pumpkin Spice Coffee Creamer and Pumpkin Spiced Rice. I was especially excited to hear that she's had success freezing pureed pumpkin because I've got a honkin' one on my porch now that needs to be taken care of! Be sure and stop by real quick to read the rest of her ideas and tell her you read about her here on Hope In Every Season! Secondly, I "met" a lovely lady this week who has written such inspiring and uplifting posts this week! I could just read her blog for hours and come away feeling so blessed! Make sure and stop by Learning to Live a Surrendered Life to meet Mrs. Mary Joy Pershing and spend some time being encouraged by her thoughtful writing! Hope everyone has plans for fun and relaxation this weekend! Be sure and link up your home-related posts below and grab my button at the top of my sidebar to remind you to come back every week! It can be anything having to do with homemaking: crafts, recipes, DIY, even just telling us about a piece of your life like I've done today! Wow! I am SO honored!!! Thank you so much! YOu are such an encouragement to me! God bless you!! I love your daughter's dress! If I could, I'd wear Colonial gowns every day. :-) Thanks for hosting the link-up! Such a cute dress! I would love to wear something like that for my Prom next year! I think that would be something rather different! I'm going to ask my mum if she can help me, as you helped your daughter! What a great otufit you created! You did such a lovley job on it. Thank you for sharing with us at TTF and have a wonderful day! She really does look like a doll! I expect she'll cherish those photos and these days for years to come. I love that dress! I like to sew myself, but am nowhere near what you made. It is gorgeous, and it is wonderful that your daughter really appreciates it!